One of my go-to Chinese dishes is Moo Goo Gai Pan. I have tried several recipes, but I must be missing an important ingredient or step, it just does not taste like the restaurant version. Does anyone have a good recipe to share? I was at a chinese restaurant awhile back and had these sesame treats. one of the servers told me you can wither eat these during the course of the meal or as dessert. 1. In a large bowl mix together the sweet rice flour with the regular rice flour and stir until they are thoroughly combined. 2. In a smaller bowl mix the sugar and the water and stir until the sugar dissolves. 3. Pour the sugar water into the flour mixture and stir until a dough forms. It should have the consistency of cookie dough. 4. Open the can of sweet bean paste and set it aside. 5. Place the sesame seeds in a large bowl or on a large plate and set them aside. 6. Next, set up a work area to roll and fill the sesame balls. Have a floured surface on which to work. Place a little extra regular rice flour on this surface to flour your hands. Place the sweet bean filling, sesame seeds, a bowl of water, and a plate to place the finished balls on close by. have you used our search? type in what you are looking for and tons of recipes will pop up for you! This will not be "electric-red" and crystal clear but the taste is good. I have not personally tried this one yet, (it was passed on to me with recommendations) but this one looks quite good also. You could always omit the bell pepper and the pineapple if you didn't want it chunky. 1. Before turning on the stove, place the sugars and cornstarch in a medium saucepan and mix well. 2. Mix in vinegar, honey, soy sauce, ketchup and pineapple juice, turn on the heat and gently bring to a boil. 3. Add the pineapple and bell pepper and stir continuously until the mixture has thickened. It doesn't get much simpler than this! low heat for about 45 minutes. Serve hot for dipping. Here's a Hot and Sour Soup recipe that we like a lot. We use to eat out a lot just for this soup. Making it at home saves a lot of money. It tastes very close to what you get at a Chinese restaurant. All of these ingredients should be available at most U.S. supermarkets, some in the Asian foods section. The white pepper and sesame oil are the "secret" ingredients that seem to give the authentic taste. Add soy sauce, meat, mushrooms, bamboo shoots, Thai Chili Garlic Sauce and white pepper. -Combine two tablespoons of cornstarch with two tablespoons of cold water in a cup. Stir until mixture is smooth. Add cornstarch mixture to soup and stir well. -Simmer for 2 or 3 minutes until soup is thickened. -Beat egg in a cup until yolk and white are combined. Pour beaten egg slowly, in a fine stream into soup. Stir soup several times. -Add tofu and green onions to soup. Stir well. Remove from heat. -Add distilled white vinegar and sesame oil. -Stir a few times and serve. and I think it tastes just like what you get at a Chinese restaurant. 1. Stir yeast and 1 tablespoon of sugar into 1-1/2 cups of warm water (95°F to 105°F). Let stand for 15-minutes. 2. Mix yeast water, 2 more tablespoons of sugar, flour, cooking oil, baking powder and salt in mixing bowl. Stir until dough forms. 3. Knead dough for 10-minutes. 4. Allow dough to rise in a warm place for 1-1/2 hours. 5. Punch dough down and divide into 12 pieces. 6. Roll each piece of dough into a ball, then flatten into a 6-inch circle. 7. Place about 1 to 1 1/2 tablespoons of meat mixture in center of dough and pull dough up over filling and pinch seams closed to form filled bun. 8. Place buns on individual 4-inch x 4-inch pieces of parchment paper. 9. Allow to rise in warm place 1 hour, until doubled in size. 10. Steam buns, in steamer, over boiling water for 20-minutes or use electric steamer. 11. Remove from steamer. When cool enough to handle, remove parchment paper from bottom. 2. Process until ingredients are blended and chopped fine. 3. Use 1 to 1 1/2 tablespoons of mixture per bun. This is my families favorite recipe for Chinese Restaurant Lemon Chicken. Mix oyster sauce, cooking sherry and rice vinegar. in skillet using cooking oil, turning until golden brown. Make sure center of chicken is cook to at least 165-F.
Stir together Lemon Sauce ingredients and mixwell. until lemon sauce thickens and turns somewhat clear. pour lemon sauce over chicken and garnish with lemon slices. are cooked, chop the scrambled eggs into pea size bits with spatula. and thawed peas and carrots. Toss lightly until mixed uniformly. Melt 2 Tbsp of butter over medium heat in a large skillet on the stove top. When the butter is melted and heated, add the rice mixture to the skilled. When done, season with ground white pepper and table salt to taste. Place in large serving bowl and garnish top with green onions. I prefer the baked version of pork buns. Just use your recipe, but instead of steaming, brush with egg and bake them. Hello everyone, I am a Chinese girl, I want to tell you about my hometown - Chinese Northeast (where a grown ginseng) . My English is not very good, if I have the wrong words or syntax error, please help me correct! Amazing recipe to try i love the recipe very much, i will surely going to try. I very love chinese food, chicken kungpaw, Steam fish sauce schuan, very loved it. In a large bowl beat eggs together until the whites break down completely. Stir in the cooked chicken or cooked shrimp, celery, mushrooms, sliced green onion whites, soy sauce, and stir well. In a heated wok add about a tablespoon of vegetable oil into the base. When the oil is hot stir it around coating the sides. Pour about a half cup of the egg foo young into the pan. The eggs should bubble up when the batter is poured into the pan. Stir the uncooked eggs gently to the sides of the pan so they cook. 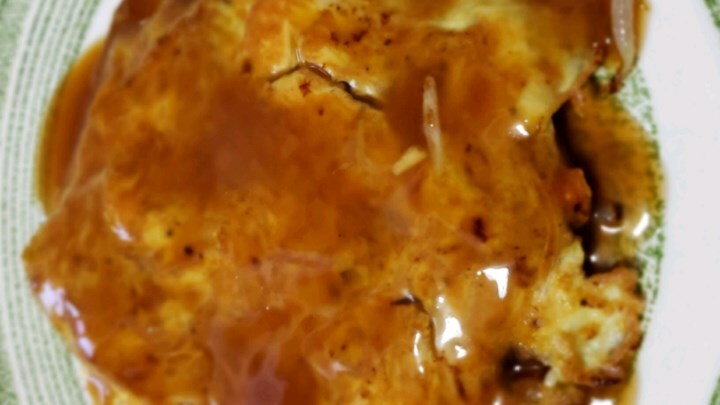 The egg foo young will cook for about 2 minutes before you will need to flip the eggs to the other side. Gently flip the egg foo young to the other side, and cook for another 2 to 3 minutes. Make the sauce by combining the chicken stock, oyster sauce, sugar, and sauce in a small pan over medium heat. Cook until warm and bubbly. Prepare cornstarch slurry by stirring the cornstarch and water together in a small bowl. Add in the cornstarch slurry and stir until the sauce thickens. Pour sauce over the egg foo young and serve. Last edited by pickman; February 18th, 2019 at 02:09 PM.